The horses are at it again, teaching me about life skills. Their latest lesson is about intuition. This past week I had quite a scare with my little mare Nevada. Because of some other commitments, six days elapsed between my visits to the barn. In that six days, Nevada developed a walnut-sized, bony growth on her lower jaw. Bone growing that fast and in such an unexpected location did not seem to bode well. OK. So the facts were pretty scary. But I knew with my body that she was fine, or at least that whatever the growth was would not be a problem at all. I knew this. There was no tension: My heart rate didn’t go up, my stomach was relaxed, my gut was at ease. There was no sense of impending disaster—at least physically. And all of that intuitive information was confirmed by the horses: Nevada herself insisted she was fine. And “R.C.,” our local “wise old horse” (even wiser, in some ways, than Midnight) chimed in. In his terse, old-man way, he said, “She’s fine,” and just shrugged me off—literally turned his head away—when I asked for clarification. R.C. 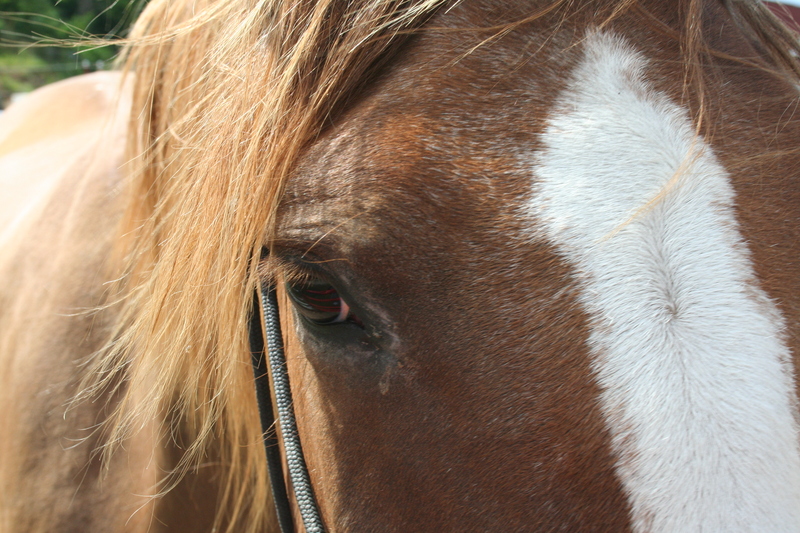 is a horse of few words, who has little patience with panicky humans. Despite all of that evidence, and despite the strength of that evidence, I continued to fret about how on earth I was going to pay for the expensive operations and radiation—yes, radiation treatments—that Nevada was certainly going to need. And how would I ever get her to Columbia to the vet school? Would she survive? Would I have to make the terrible decision to put her down? And on and on I went, not eating, not sleeping…. The whole time, the Witness part of me was just watching this play out, shaking its head, amazed and a bit sad to see how I was winding myself up over nothing while busily not listening to the quiet voice of wisdom that my body was providing. This was quite a lesson for me. The vet’s diagnosis, two days later—a problem with teething that would resolve itself on its own within a month or so with no further treatment at all—was so anticlimactic that I cried and laughed at the same time. Wow. All that drama for absolutely nothing—and the entire time, my body, my intuition, knew that it was absolutely nothing, but I refused to listen. This is just the latest in a series of such incidents, but this one was HUGE because of just how enormous the gap was between my imaginings and reality. As usual in life, the “lessons” (the Guides object to me calling them “lessons”) just get bigger and bigger until I finally get it. I think I’ve finally gotten it this time. I’m going to go with intuition from now on. Yes, being prepared is a good idea, but worrying myself to the brink of insanity is most definitely not. I’m going to hang up my Drama Queen crown. Maybe I’ll even put it on Craig’s List. ← Who says horses can’t talk?